Louise Norris had posted a Thanksgiving Cavalcade of Risk at Colorado Health Insurance Insider. The ACA rollout issues play heavily in the topic list, but there are also posts about disability insurance, remembering our vets and corporate social media risks. Don’t miss the outstanding winter landscape photos illustrating the issue, nice! Have a safe and risk-free holiday – if you plan to fry up a turkey, William Shatner has some advice for you. And unless those turkeys are on your plate, watch out for those pesky birds! Warm Thanksgiving wishes to all! Hank Stern has posted a fresh edition of Health Wonk Review at InsureBlog – and it’s a special one: Health Wonk Review: Pre-Thanksgivukkah edition. Hank created an excellent and thoughtful theme to frame this news-and-analysis-packed edition of excellent entries. He’s also included an eclectic selection of truly inspiring quotes between entries. Check it out – good reading matter for your lunch hour. Review of work produced by Peter Rousmaniere, with support from Concentra and Broadspire. Of the 15 occupations that are expected to see the largest numerical growth between now and 2020, foreign-born workers, immigrants, are currently over-represented in eight of them. And of those eight, six are classified as “low-skilled” for which a high school diploma is not required. The Bureau of Labor Statistics projects that these occupations will grow by 42% between 2010 and 2020. Odds are that they will continue to be over-represented by foreign-born workers. While immigrants comprise 24% of all the workers in the Agricultural industry, they make up 61% of the field workers. As of 2010, 29% of immigrants between the ages of 25 and 64 lacked a high school degree, as opposed to 7.4% of the U.S.-born population. And, although immigrants make up 15.8% of all U.S. workers (something a bit hard to believe when you consider their ridiculous over-representation in those fast growing industries), they account for 20% of all reported injuries. These facts, alone, make Peter Rousmaniere’s Work Safe: An Employer’s Guide to Safety and Health in a Diversified Workforce (PDF), published with support from Concentra and Broadspire, a timely and compelling read. Moreover, it’s free and is available as a pdf download at Broadspire. Rousmaniere, publisher of the Working Immigrants blog since January 2006, and, until November 2013, a columnist for Risk and Insurance Magazine, has, until now, been a “voice crying in the wilderness.” He’s been banging the drum and sounding the alarm, saying that we, as a nation, and particularly as employers, are unprepared–indeed, are refusing to prepare–to deal with the needs and cultural differences presented by immigrant workers. A Harvard MBA, Rousmaniere believes that, although there is a moral imperative for doing so, making the effort to become sensitive to the language and cultural differences in our immigrant workforce just makes good business sense. And in this 57-page, 6×9 inch, handsomely produced Employer’s Guide he skillfully makes the point. Although immigrants are also over-represented in high-skilled jobs, this book is really aimed at the vast underbelly, immigrant workers who lack the education and skill set to navigate through the thorny thicket of work rules and health care issues, immigrants who may speak wonderful Spanish, or any number of other languages, but nary a word of English. The theme running through the entire book is one that urges us not to assume that English-challenged immigrant workers understand what we say, even when we say it in their language. Rousmaniere makes this point over and over again, so much so that I thought the book could have been somewhat shorter without losing a thing. In the Workers’ Compensation chapter, Rousmaniere offers a novel idea — the prepaid indemnity card. He points out that about a third of the people who earn less than $30,000 a year don’t have bank accounts and, consequently pay hundreds of dollars a year in check cashing charges. To help them, he suggests that claims payers contract with debit card vendors to pay indemnity benefits directly to injured workers via the card, which the vendor would arrange to have honored at ATMs. Interestingly, this isn’t a new concept. Rousmaniere says, “An increasing number of employees receive their wages via a payroll debit card.” Left unsaid is what that “increasing number” actually is, but if you think about it, his idea might have more than a little merit because of the inexorable gravitational movement of technology. The book has an extensive chapter on “Medical Care Across Cultures,” and here Rousmaniere is writing about all medical care, not just work injury care. Again, it’s all about translation and culture. He gives an illustration: “In some societies, it’s believed that coughs are always fatal.” I found myself wishing he’d enlighten us as to which ones. He writes about “Job-Specific Challenges in Cross-Cultural Care” and says that “Medical Case Managers are likely to have to confront a patient’s steep learning curve when it comes to understanding the American health care system.” I found that one a bit rich, as in – does any patient understand the American health care system, if you can call it that. In fact, I found that much of the chapter on health care really applied, not only to immigrants, but also to many native-born Americans who are unskilled at navigating the health care maze and have what Rousmaniere calls “low health literacy.” For example, he offers a bullet list of “side effects” for this affliction: failure to seek preventive care, leading to more ER visits and hospital admissions; no written agenda for medical visits; missed appointments; lack of follow-through with imaging tests; misuse of medications; and so on. Rousmaniere suggests an “Rx for Hospitals: Professional Interpreters.” Moreover, he points out, “The Civil Rights Act obligates medical providers to arrange for patient communication in the most suitable language for the patient.” I did not know that. He offers health care providers another bullet list of tips for overcoming language differences. In today’s health care world the first tip, “Slow down. Plan double the normal time,” might be hard to achieve. Trouble is, the tips all make good sense. They’re thoughtfully done, and, were it not for our health care assembly line process, they’d be the norm. My bottom line takeaway to Rousmaniere’s health care recommendations: they will take nearly dictatorial leadership to implement. The translation and interpreting chapter lists a number of resources of which health care and insurance pros will likely be unaware. He compliments California for Senate Bill 853, which “requires that health insurance organizations provide free and timely translation and interpretation services for patients with limited English proficiency.” And Rousmaniere’s “10 Planning Steps for Translation and Interpreting” is spot on. But for my money, the little jewel in this book is the last chapter – “Free Online Resources.” I loved it. He has hunted down a wonderful library of resources that every professional in the field should have at his or her fingertips. They come as General Resources, such as a number of truly excellent offerings from the State Compensation Fund of California, Spanish to English and English to Spanish dictionaries published by OSHA, and resources aimed at a number of industries, the ones with all those low-skilled, fairly uneducated immigrants. Excellent, indeed! All this may be a bit much for middle and small market employers, who may not think they have the resources or time to invest in this level of acculturation. I suspect that this book may not be a big seller for them. Health care professionals, on the other hand, would be well-advised to study it closely. The official launch of the Guide will take place at the National Workers’ Compensation Conference in Las Vegas, NV, November 20-22. At his finance blog with the homey name of Mom and Dad Money, Matt Becker makes his hosting debut with Cavalcade of Risk – Separating the Good Risks from the Bad. Check it out! Opioids Webinar – Out friend Joe Paduda, Principal of Health Strategy Associates, is hosting a free webinar next week: Uncapping the Truth: First Annual Survey of Opioids in Workers’ Compensation. It’s sponsored by CID Management and will review results of the Opioid Management Survey recently conducted by his company. It’s scheduled for November 12, 2013 at 2PM EST. Seats are limited, register here. Workers Comp Report – Those of us in the workers’ comp field are used to getting our news from trade journals and the web, but it’s rare to find a story in the so-called mainstream media – unless things have blow up to crisis level or reform sparks political posturing. Sot we were delighted to see a major feature in CFO magazine: Special Report – Cutting Workers Comp Costs. In the intro, David Katz says that “workers’ comp-related costs are still relegated to the dark corners of financial statements,” but he makes the case that potential drains on cash flow and perverse medical and legal incentives make workers’ comp worthy of CFO scrutiny. 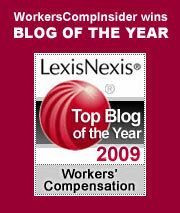 He authors two parts of the series, Should CFOs Care About Workers’ Comp? and The Safe Way to Slash Workers’ Comp Costs. WCRI’s Richard Victor authors the third article, Do Financial Incentives Spur Unneeded Medical Care?. Football – Two more professional football players are suing the NFL and helmet makers for brain injuries and concussive brain trauma. We’ve written about this issue numerous times in the past, including NFL and Dementia: A Changing of the Guard and A Bullet to the Heart. Also see: Junior Seau’s suicide raises the issue of traumatic brain injuries and this dramatic New York Times feature, Images of Brain Injuries in Athletes. View Frontline‘s full 2-hour investigative report on this issue: League of Denial: The NFL’s Concusssion Crisis. Plus, the site has running news reports and stories on football and concussions. If you’ve been following the blog-o-sphere and the LinkedIn-o-sphere, you know that the space is crowded. Lots of workers comp practitioners have glommed on to the idea that the way to get ahead is to write and post frequently. Connect with more than 500 others in the profession. Write something, anything, put your name on it and throw it up against the wall to see if anything sticks. Kind of the way Garrison Keillor used to say he changed socks on a book tour. Every once in a while, something helpful and interesting appears and gains a bit of temporary caché for itself and for its author. Mostly, the topics center on the persistent rise in medical costs and, even more often, on the insidious and, some would say, criminal use of opioids, which a regrettable number of alleged doctors, having checked their Hippocratic Oath at the door, are prescribing at a hell-bent-for-leather rate at a hell-bent-for-leather profit. The poor, unfortunate souls for whom these scripts are written are nothing more than high-cost collateral damage. Consequently, efforts to control workers compensation costs are now almost entirely dedicated to reining in costs associated with medical care with a huge emphasis on prescription drugs. My colleagues and I have always believed (and, I add, have time and again been proven right) that the workplace is the best place to control and manage work injuries and costs. That, in order to do that, employers need to be educated so that they understand that they, not the vendors to whom they outsource payment responsibilities, are the hub of the workers comp wheel. In the mid 1990s, at the height of the worst workers comp crisis ever to hit the market, this hypothesis became fact. Our clients, as well as the clients of a number of our competitors, overcame the workers comp troubles of the day because they learned that treating workers compensation in a Management 101 kind of way reduces costs to a minimum and goes a long way toward bolstering profits as well as employee morale and productivity. This meant training supervisors in the proper response to work injuries, keeping close communication with injured workers, creating good relationships with treating physicians, bringing injured workers back to work under medical supervision, seeing that injured workers received full pay while on modified duty, and measuring success every month just as they measured success in every other business enterprise. These, and other program components, gave these enlightened employers a distinctive competitive advantage, and the results spoke for themselves. Something has happened between then and now. I think of it as the “workers compensation dark ages.” There are still enlightened employers, but many have lost their way. We took a system that we had made relatively simple for employers to manage (and let’s not forget that it is employers who ultimately pay the bills) and we made it progressively more complicated. We made medical care into a haunted house maze that only experts can navigate (hence, the rise of medical experts). Employers, suddenly realizing that they are now the south bound end of a north bound mule, have relinquished control to a myriad of vendors, the “experts.” Not all employers, of course. Large, sophisticated organizations with well-oiled risk management departments, have not lost the focus, although they have to work harder to stay the course. The question is: What are we going to do about it? Could it be that the way forward is by way of the way back?